For the last several years whenever my family has more than a few days of consecutive vacation time we tend to flee to the deserts of Utah, soaking in the magic of places like Zion National Park, Bryce Canyon, and my all time favorite: Moab. The beauty of these arid spaces boggles my mind. I love the vast stretches of openness, unmarred by massed humanity, strip malls and suburbs. I admire the extreme essence of the desert, its ferocious, unapologetic existence, one that a visitor can never take lightly because here nature is not forgiving. I’m in awe of the transient loveliness found in clump of spring wildflowers, trickling stream, or sand arch. All of which may be gone by tomorrow. For most people the word desert has a negative connotation. It conjures up images of stifling heat, cow carcasses, buzzards and dehydration. In folklore and fiction deserts often symbolizes death, yet all of us go through desert times in our spirit and in our art. These are the seasons where nothing comes easy, every day is a struggle, and giving up becomes a very real option. I began writing fiction about seven years ago and the novels that appeared on my pages were sweet, homey stories about family, love and community. After spending nearly seven years away from the town where I grew up, these things were very dear to me. The fiction I wrote reflected how much I treasured being home again surrounded by the things I had missed; writing about them was nearly effortless. Then big changes came: another move; lonely times, hard times. Sweet stories didn’t flow anymore, no matter how hard I tried. I sat at my computer for hours forcing out the words, all of them stilted and terrible. I was in the middle of a writing desert and my soul was in the midst of a spiritual one. In the Bible God often uses the desert as a place of training or rehabilitation; it’s a place to equip his chosen ones. Abraham, Moses, Elijah and Jesus all spent time apart from the societies that they had been raised in, the families they loved. When Israel escaped Egypt, the fledgling nation spent 40 years wandering through a desert that should have only taken about two weeks to traverse. God led many heroes of the faith, including his own Son, deliberately to this desolate setting. The wasteland is not a gentle backdrop for growth. Scarcity and stress define the reality of these desert sojourns. Unless God provides food and water, these pilgrims starve. Temptation to despair, to reject promises given by God become an all-consuming battle. Would Abraham really discover the promised “land that God would show him” at the end of his journey? Would God really lead Moses and the nation of Israel to “a good and spacious land, to a land flowing with milk and honey?” Would Jesus face the many temptations of the devil and reject them for the truth of His Father? Despite the suffering created by such a barren environment, these men and women of the Bible chose to stay there. Why? The desert is a place of spiritual revolution, not of personal retreat. It is a place of inner protest, not outward peace. It is a place of deep encounter, not of superficial escape. 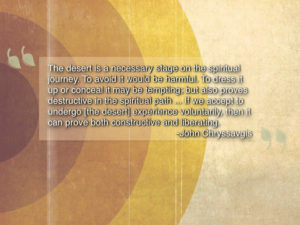 It is a place of repentance, not recuperation … The desert is a necessary stage on the spiritual journey. To avoid it would be harmful. To dress it up or conceal it may be tempting; but also proves destructive in the spiritual path … If we accept to undergo [the desert] experience voluntarily, then it can prove both constructive and liberating. Biblical heroes and early church leaders embraced their time in the desert. Looking back over their lives, I see the beauty that came from these sacrificial pilgrimages. Character, revelation, sacred words, teachings–these were the fruit of time spent in the wasteland. Like desert wildflowers, these gifts were vibrant patches of life that defied the elements. It took awhile, but finally I decided to sit still in my writing wasteland. I would stop longing for something that wasn’t there. Instead, I would glean whatever lessons I could from the dry time. Many of us are tempted to think that if we suffer, the only important thing is to be relieved of our pain. We want to flee it at all costs. But when we learn to move through suffering, rather than avoid it, then we greet it differently. We become willing to let it teach us. We even begin to see how God can use it for some large end. Suffering becomes something other than a nuisance or a curse to be evaded at all costs, but a way into deeper fulfillment. Ultimately mourning means facing what wounds us in the presence of One who can heal. After several months, I saw the skeletal framework that God was constructing in my life. I needed to be more honest with myself and others. If the light-hearted fiction of the years before would not come, I had to let go of that identity. Instead I needed to find the courage to embrace the deep, painful and often dark realities that my soul wrestled with. The stories that came into my mind were grim and intense. Did I truly believe that the struggle between good and evil was something worth writing about? How deeply should I describe the evil with which my heroes battled? And the question that haunts every moment of our humanity: what would people think? This question crippled me as much as my writer’s block. I stumbled back and forth between the clunky, forced words of my sweeter stories and the fear of what people would think of my darker ones. If I traveled down the first path, I would be lying to both myself and my readers, but at least I’d look inoffensive and harmless while doing it. If I traveled down the second path, I’d write what was in my heart, but could earn people’s contempt or ridicule. Unless I wanted to stop writing altogether, I could only dance with this predicament for so long before decision time came. The desert had distilled my choices down to three stark realities: stop writing, be a fake, be a real weirdo. While none of these options came without cost, the real weirdo choice would at least bring nourishment to my soul, if no one else’s. The Bible is full of weirdos who made illogical, ridiculous decisions at crossroads moments. Abraham left his prosperous, familiar life in Ur because a newly discovered deity told him to pack up and head east to an undisclosed location. Moses helped a ragtag group of slaves defy a world power and then relocate to a wasteland without resources. Jesus confounded and defeated the powers of darkness by voluntarily giving Himself over to them on behalf of people who rejected Him. Was my defection into the weirdo camp anything compared to these decisions? In scope, no. Not even a little bit. In personal sacrifice, maybe. But look at the company I was surrounded by. And here is another comfort: God takes care of His people in the desert. Springs appear from ex nihilo, ravens bring bread and meat, the enemy flees and angels come to minister. Whatever happens, I’ve found the secret to living and writing in desert times is to accept the landscape of my reality for what it is, not what I wish it was or what it looked like in the past. There’s a stark and enigmatic beauty to be found in the wasteland, one that can be easily overlooked. If I can embrace this beauty, who knows what lessons I can learn and what stories can flow from my imagination? I will drink deeply from the well in the desert. The water tastes sweeter here.